The Farm Brewery Law allows for the issue of a new Farm Brewery License. Supported by New York State Senator David Valesky, it’s designed to provide an incentive for farmers to grow hops and other agricultural products associated with the production of craft beers and cider. In 2012, with the new license, farmers and craft brewers were able to brew and sell beer from their farm if 20 percent of the hops in the final product and 20 percent of the other ingredients (barley, wheat, yeast) were grown in New York State. This rule will continue until the end of 2018. From January 1, 2018 to December 31, 2023, no less than 60% of the hops and 60% of all other ingredients must be grown or produced in New York State. After January 1, 2024, no less than 90% of the hops and 90% of all other ingredients must be grown or produced in New York State. License holders can sell their products directly to consumers for consumption on or off the premises, and conduct beer tastings at the licensed location. Under the farm brewery license, brewers do not need an additional permit to serve beer by the glass, which has the highest return for brewers in terms of sales, according to the Governor’s office. In 2013, New York doubled its hop acreage to 140 acres, and growers have estimated that there’s been a $2 million investment in hop growth over the last two years. The state budgeted $40,000 this year for hop planting at the New York State Agricultural Experiment Station in Geneva in order to conduct research on how hop varieties perform and how to control pests and disease. There’s also over $100,000 in funding going to New York Craft Malt in Batavia for the purchase of equipment and machinery to process malt-grade barley. Over 100 years ago, New York State was the largest hop growing area in the country. Today, American hops are grown mostly in Washington and Oregon. Otsego County was once the country’s “hops central” and hops are still found growing wild in New York State to this day. Hops need a lot of water to survive and hops farmers have to set up special irrigation tubing networks to deliver the many gallons of water that hops need daily. The industry is also looking for cuttings of native wild hops in the area, some of which were probably left over from Prohibition and may be especially resistant to pests and disease. 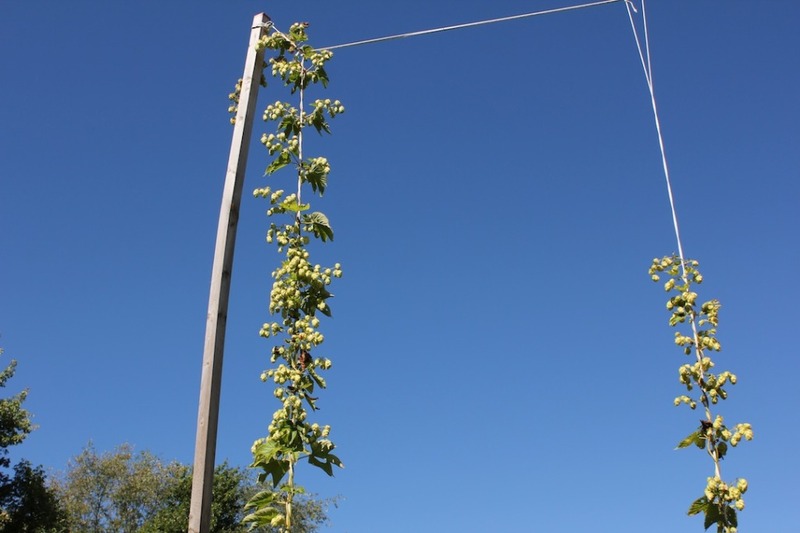 If you’re a landowner who has wild hops growing on your property, you’re invited to go to the Geohopping website, where Cornell Cooperative Extension and the Northeast Hop Alliance are tracking reports of “feral” hops. Go to the North East Hop Alliance to find out more.